Seminal American feminist and influential Transcendentalist Margaret Fuller was born May 23, 1810, in Cambridgeport, Massachusetts. By her mid-twenties, Fuller had developed a list of friends and collaborators that reads like a Who’s Who of the United States in the early to mid nineteenth century, covering Thoreau, Emerson, Horace Greeley, and Bronson Alcott. Intellectually aggressive, persuasive and charismatic, Fuller’s trailblazing spirit established her among the pantheon of notable teachers, thinkers, and writers of her era. She forced Harvard University to evolve, and grant her access to the library stacks. Attuned to inequality and social injustices, Fuller relentlessly exposed and addressed aspects of culture and society in deep need of reform. Passionate in support of women’s suffrage and rights to an education, she was just as tenacious a proponent of the abolition of slavery and prison reform. 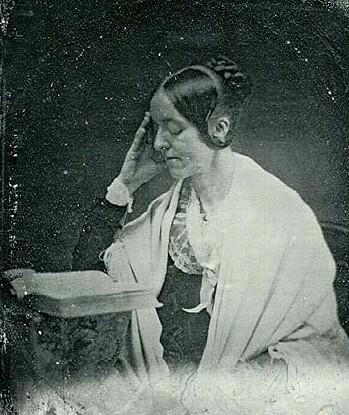 Following her tenure replacing Elizabeth Peabody as a teacher at Boston’s Temple School, organized by Bronson Alcott, whose “controversial” pedagogical methods were steeped in the belief that all children were cable of learning well, and responded better to dialog rather than rote learning, Fuller initiated a series of philosophy workshops for women, conducted in the Socratic style. Fuller referred to these neo-Platonic workshops as “Conversations.” Enormously popular among educators, authors, the wives of politicians, and future luminaries of the women’s civil rights movement, the series ran for five years, during which she edited Emerson’s Transcendentalist periodical, The Dial. Her Conversations provided an unprecedented forum for women to discuss politics, morality, philosophy, and theories of social justice, topics of conversations to which women had not been previously invited as active participants. Margaret Fuller’s groundbreaking Feminist study, Woman in the Nineteenth Century, represents an embellished record of one of her Conversations. Just forty years after her birth in May 1810, Margaret Fuller drowned on June 19, 1850, with her husband and young son, following a shipwreck off the coast of Fire Island, New York. Dickenson, Donna. Margaret Fuller: Writing a Woman’s Life. Fuller, Margaret. Woman in the Nineteenth Century. Von Mehren, Joan. Minerva and the Muse: A Life of Margaret Fuller.